Aruba is a watersports paradise that’s famous for adrenaline-pumping activities like windsurfing and diving. 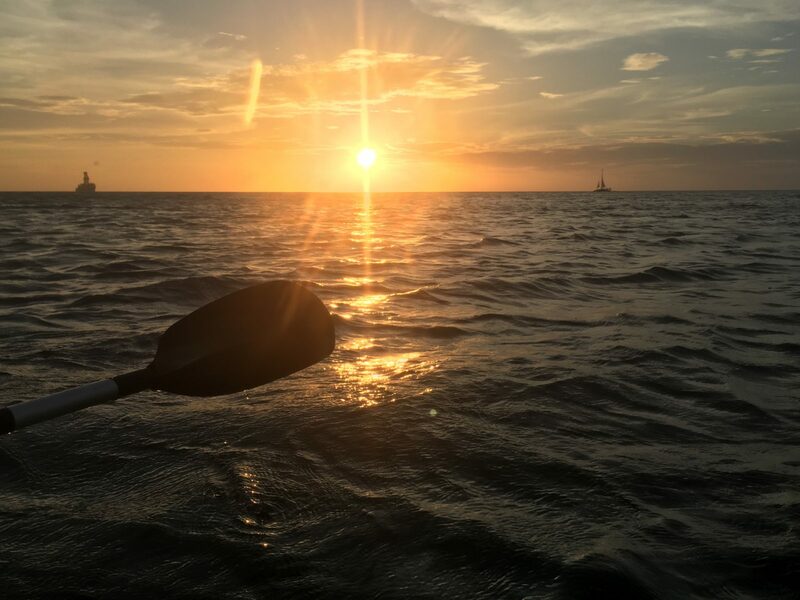 So who knew that my most memorable experience on the water would be watching a serene sunset while aboard a drifting kayak? I’m not a strong swimmer, so when I visited Aruba in July, I sought out other activities — from sailing to submarines — that would give me a glimpse of the island’s marine life. But my favorite way to explore the Caribbean waters turned out to be night kayaking in a glass-bottom boat equipped with LED lights. I’d never been kayaking at night before, so I wasn’t sure what to expect. I arrived at Arashi Beach about an hour before sunset, and after a few minutes, a truck pulled into the parking lot, hauling several kayaks. Zenon, a native of Aruba, laughed and told me that he’d started the business a year ago after he and his wife returned from their studies in Holland. 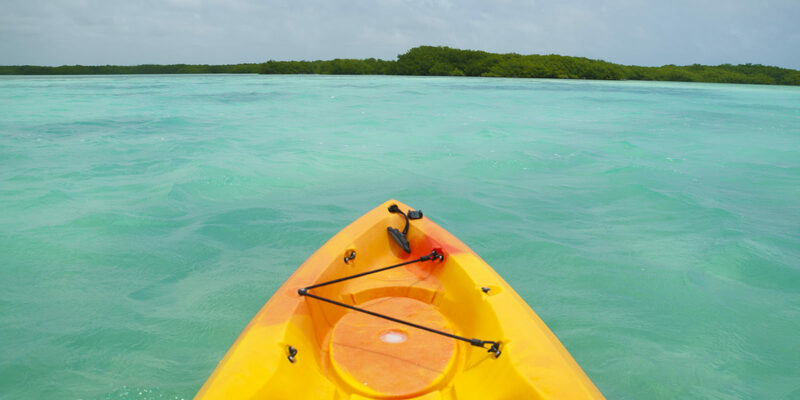 They found kayaking to be a fun, active way to explore the island, and decided to share the experience with visitors. The nighttime paddle is just one of the excursions they offer, and it’s become a popular activity. I was one of only two people going on the evening adventure, so it felt like a private tour. After we settled into our kayaks and pushed off from the beach, Ricardo led us down the coast, slicing through the water with ease. As we followed him south, we zig-zagged between the shore and farther out to untouched waters, far away from swimmers and fishermen. 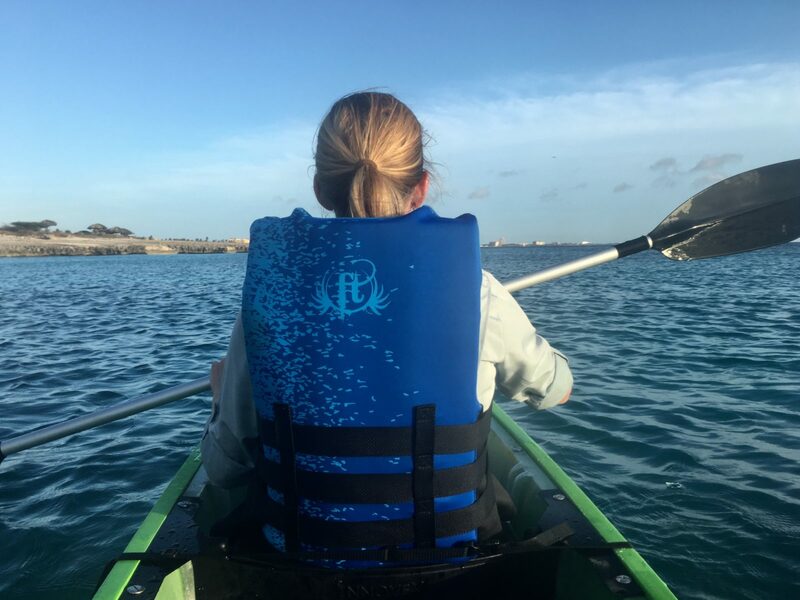 It was just my second time kayaking in the ocean, but this time around, the waters were much calmer, which made it easier than expected. Still, we covered a lot of ground (er, waves) — paddling from Arashi Beach to the Palm Beach resort area. Ricardo was a low-key guide, possessing the laid-back, friendly nature of a native islander. He answered our questions and gave us direction when necessary, as well as time to drift and admire the scenery. Although he was in a traditional kayak, there was still enough sunlight — and the water was clear enough — for him to see below the surface and occasionally point out marine life. As Zenon’s daughter had mentioned, I mostly saw chubby, cartoonish-looking starfish scattered across the ocean floor like stars from an old-school video game. 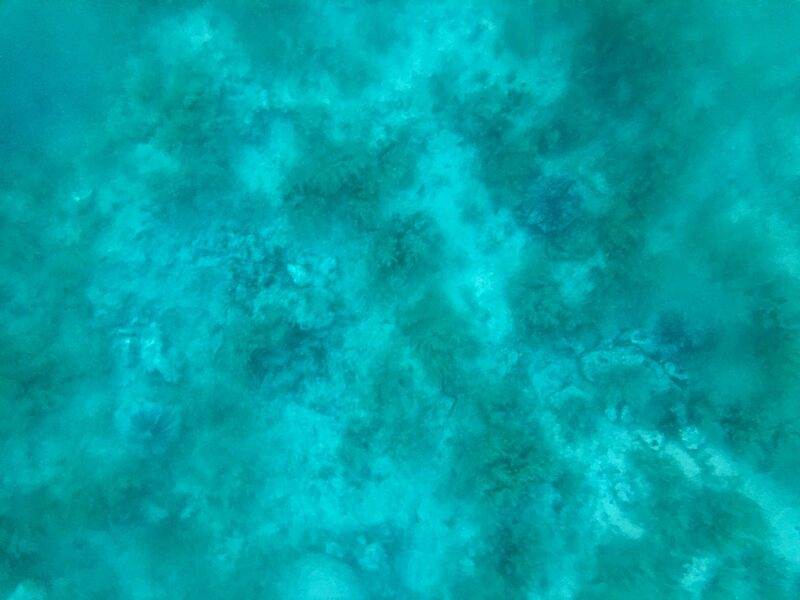 But the water was a marvel in itself — so bright and turquoise, it looked like it was enhanced by an Instagram filter. You can opt for a 2-person kayak if you’d like to share the work with a partner, child or lazy friend. When I signed up for the excursion, I had assumed that the highlight would be peering through the boat’s glass bottom at ocean life. I hadn’t anticipated that the evening’s most stunning sight would be above the surface, not below it — in the form of an amazing sunset. 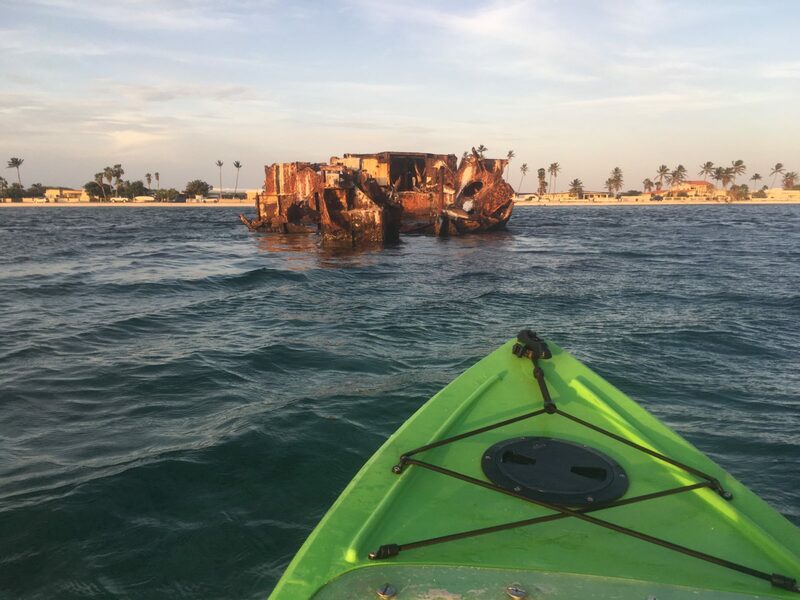 As the sun descended, Ricardo shepherded us to the perfect viewing spot: the Baboo shipwreck, a rusted shell of a boat that rises from the water’s surface. Ricardo told us that the ship was originally sunk further offshore to create an artificial reef, but was pushed to its current location by Hurricane Lenny in 1999. We spent about twenty minutes circling the shipwreck, resting, drifting and admiring the glowing sky. I appreciated that we were far enough from the shore that we couldn’t hear the sounds of rowdy beachgoers; and the peace and quiet was nearly palpable. As I looked toward the horizon, I felt like we were alone in a vast expanse of ocean — aside from the handful of stately pelicans that perched on the shipwreck behind us. The sunset itself was beautiful: a collage of pinks, yellows, blues and oranges spilled over onto the darkening waves. After the sun disappeared, rays of light rose up in a V-shape from the horizon in a way I’d never seen before — even Ricardo agreed that it was an unusual sight. Even though it’s the Caribbean, it gets a bit chilly on the water after dark. Consider wearing long sleeves and water-resistant shorts or pants — which will also help protect you from bugs and the sun. After sunset, we made our way back to Arashi Beach. We didn’t encounter anyone besides a few fishermen; occasionally, we had to do the limbo under the occasional fishing line attached to an offshore balloon. Eventually, it was dark enough for us to turn on the LED lights and look again through the boat’s glass bottom into the water below. I spied a few more starfish, as well as several schools of small fish swimming quickly under the kayak. Ricardo advised us that sometimes the fish actually surprise kayakers by jumping into their boats. Toward the end of our journey, Ricardo instructed us to turn off the LED lights. For a few moments, we fully immersed ourselves in pitch-blackness, with only a few lights twinkling on the distant shore to guide us. We finally docked back at Arashi Beach, now a dark and deserted stretch of sand. Zenon met us at the water’s edge to help bring in the kayaks. Before we went our separate ways, he offered us a few juicy mangos from a tree in his yard. It was a simply sweet — and authentically Aruban — way to end an evening filled with serene and special moments. Arashi Beach has limited facilities — you need to pay $1 to use the restroom at the small café. And when you return from night kayaking, the water may be shut off, so bring some of your own to rinse off your feet.